From left are (front row) Rachel Clarke, Riley Molineaux, Mackenzie Osborne, Tori Simmons and Harris Clarke; (next row) Addie Swisher, Rachel Taft, Brian Farrow, Chris Cunningham, Jacob Taft, Ethan Eppihimer; back: Savannah Eppihimer, Matthew Brocklebank, Matthew Kleinfelter, Noah Booth and Hunter Koontz. 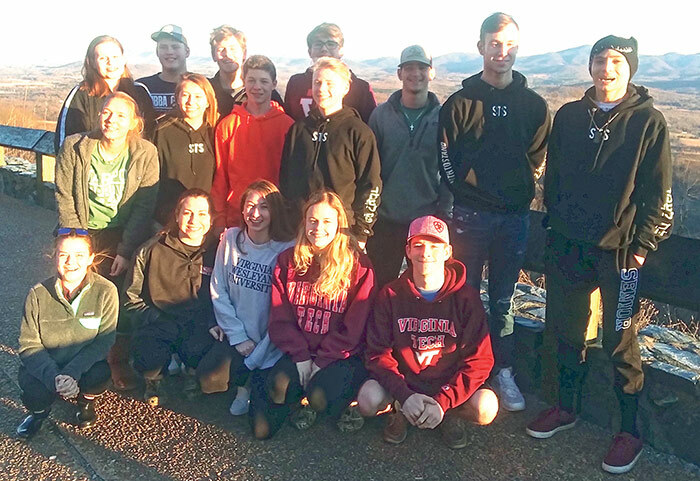 Sixteen teens and five chaperones from Irvington Baptist Church (IBC) recently attended the “Strength to Stand” Youth Conference in Pigeon Forge, Tenn. They joined 8,300 other attendees representing 12 states.The Conference is hosted annually in several locations throughout the country by the Scott Dawson Evangelism team and this year was the 25th anniversary of the event held in the Smoky Mountains, said IBC youth director Hazel Farmer. Speakers included Scott Dawson, Joey Hill, David Nasser and Algernon Tennyson, all of whom led the group through Bible study based on the importance of knowing scripture and being able to draw from God’s word for the strength to face life’s trials and temptations, said Farmer. Participants also enjoyed Christian bands Rush of Fools, Crowder, Andy Mineo and Mosaic MSC, she said. The youth recapped their trip during the worship service on Sunday, January 27, with the teens conducting the entire service. “They did a wonderful job and we are so proud of them,” said Farmer.